A - Most Americans who follow current events have seen the pictures. We think we know what they represent. We think we have a handle on the story that they tell. During 2003, prisoners at the Abu Ghraib prison in Iraq were sexually humiliated and molested, terrorized with dogs, brutalized, tortured, and murdered. By Americans. The abusers were military police, military intelligence, private contractors, and CIA interrogators. 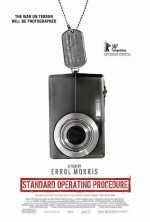 Errol Morris' new film, Standard Operating Procedure, opens the photo album on Abu Ghraib and initiates an inquiry both indebted to and a world apart from the fleeting sensationalism of the mainstream media's coverage. The film's taste for the dramatic might provoke accusations that Morris is aiming for cheap agitprop. Nothing could be further from the truth. SOP is a spellbinding film about a grave and inflammatory topic, a vital rumination that upends one stone after another and then holds up a microphone to the emerging grubs. Morris' refusal to utilize the Abu Ghraib scandal as a political cudgel might be noble or disgraceful, depending on your outlook, but with SOP, he has unquestionably crafted a haunting work that digs deep and cuts deeper. More so than any of Morris' previous films, SOP assumes a familiarity with its subject matter. The filmmaker is speaking to an audience already branded with the images that inhabit his film: hoods, dog leashes, wires, orange jumpsuits, naked men in piles, cadavers in ice-filed bags, and all those surreal, grotesque American grins and thumbs. To assume this common frame of reference (and the accompanying wondering outrage) is a bit of a detour for Morris. The filmmaker's previous documentaries possess a tone that is expansive and yet reserved. SOP signals in its opening moments—accompanied by a searing, histrionic score from Danny Elfman—that it is a more passionate creature. The film that emerges is urgent, probing, and stark. It leaps into the abyssal inscrutability of Abu Ghraib (and our reactions to it) feet first, and on its way down delivers the best documentary experience of the year to date. Morris employs a methodology that is now familiar: furiously edited interviews, with no narration and only minimal intrusion from the director's off-camera voice. The appeal of Morris as a credible documentarian is his (naïve? disingenuous?) resolve that his subjects should be allowed to construct the film's narrative, insomuch as his films could be said to have narratives at all. SOP focuses on the perpetrators (and scapegoats) of the Abu Ghraib scandal, permitting them to relate events, explain their thinking, air their grievances, and ruminate out loud on their regrets. Many of the familiar faces among the interviewees seem to be female: Brigadier General Janis Karpinski, Specialist Sabrina Harman, and Private First Class Lynndie England, she who is damned to forever be the face of the scandal. The most visible male offenders are still in prison (or, depending on your view of the real perpetrators, still calling the shots at the Pentagon and collecting lucrative speaking fees). The talking heads are intercut with lavish special effects that deconstruct the more notorious photographs and breathe life into the words (some crude, some poetic) of Harman's letters home. Morris also makes liberal use of stylized, ultra-slow-motion recreations. These have a music video aesthetic that highlights the uncharacteristic gothic mood that he seems to be aiming for, and they don't always work. Still, these sequences serve to break up the visual monotony of the interviews, and Morris often employs them in cunning ways, tapping into those aforementioned shared memories to conjure dread just shy of a horror movie. When we begin to wonder whether the interviewees will discuss the use of dogs at the prison, a dark shape lurches past the foreground, out of focus, eventually resolving into a close-up of a German shepherd that invites genuine chills. Unlike most documentarians, Morris has little interest in merely spinning a yarn or proffering a polemic. SOP, like much of his work, suggests that he trusts his material to uncover its own profundity, relying on only a rudimentary story to hold everything together. Few documentary filmmakers are content unless the audience walks away either entertained, inspired, or convinced. Morris asks that we think, truly think, about what we are shown. SOP doesn't have a thesis, but it has themes. Chief among these are the mystery of photographs: their evocative power, our reflexive need to take and pose for them, and the perils of the partitioning and excluding frame. "If it wasn't photographed, it didn't happen," notes one of the film's interviewees. One of SOP's unexpected marvels is an investigator's discussion of the forensic challenge in reconstructing the prison abuses from three separate digital cameras. Thousands of photos glide across the screen, lining up along common scenes of shame, rearranging themselves into timelines of brutality. Through the interviewees' words and his visual flourishes, Morris expands the scope of his inquest beyond what it shown in the photographic frame to include what is beyond it and behind it. SOP is mostly free of political and moral tongue-clucking. There is little contextual discussion of the Iraq War raging outside the prison, and only few lofty statements about American morality or empire. The elements in SOP's photographic collage are both broader and more timeless: bullying, mob mentality, chain-of-command, revenge, guilt, responsibility, judgment, power. In this, Morris avoid caricaturing his interviewees as Ugly Americans, and instead finds a tantalizing, contradictory tone in his treatment. On the one hand, he permits them to be woefully, specifically human, allowing justifications and explanations to pour forth without comment. On the other, his blood- and shadow-flecked styling invests them with the dread agency of legendary creatures in a fable about human fallibility. Granted, the film paints some of the central actors in an unashamedly menacing light—and justifiably so, given the personality traits and crimes revealed. And yet, SOP cannot in any sense be characterized as a righteous indictment of the actors at Abu Ghraib. When Morris intrudes on the film in a distant, off-camera voice, he seems more curious and flabbergasted than angry. The interviewees themselves rarely seem defensive. The most common reactions are disbelief, bitterness, and a longing to forget it ever happened. Of course, it cannot be forgotten, by the perpetrators, the victims, or the world. There are photos.